That's Lee Van Cleef in "The good, the bad and the ugly". I love this movie, seen it several times always with the same pleasure. Saw a Korean movie last december with my brother that was called "the good, the bad and the crazy" and it was great, in another style, really crazy and fun! Another car for my calendar, it's a Ford Capri - so I'm told, I don't recognize cars unless I've driven them or been driven in them for years - and I've never had a Capri, too bad, it looks cool! Centering on Pottery, Poetry and the Person is a fabulous book. I don't know exactly why I felt compelled to buy and read it but I love it. 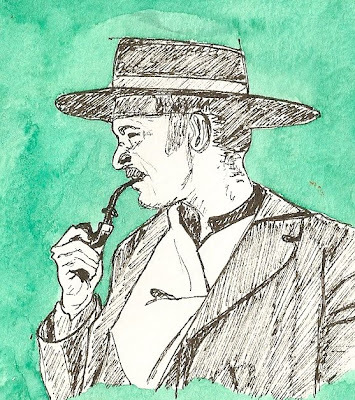 It's very difficult for me, because of the writing, not my first language, and a beautiful, unique, poetical way of writing, and deep meaning. I read it very slowly and feel things moving and growing inside as I read and re-read each paragraph - it's that difficult for me : ) ! The other book is a big thriller, well done, very good for reading near the swimming pool, if you have one, or in bed until very late because you want to know the end and begin something else. You have been busy! 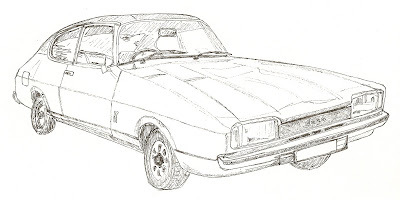 Some excellent sketches - and as for the Capri, well I had one once, a long time ago. I don't see them these days...! oh wow! Such a beautiful sketch, and the car is just amazing! Your book drawing is as pretty as always...but the car is just....WOW! I haved known many people to whom Centering was a very important book ever since it came out in 1962. It is nice to find that it still has value for someone meeting it after all this time. 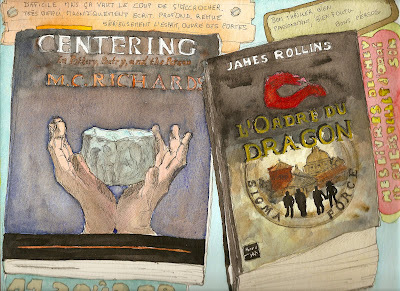 You really illustrate books well!